The two biggest questions facing EVANESCENCE — and in particular, vocalist and co-founder Amy Lee — upon the release of its third album, "The Open Door", is whether the band could replicate the multi-platinum success of 2003's breakthrough "Fallen", and if Lee could still compose memorable songs without co-writer and founding guitarist Ben Moody. The perception that Lee needed Moody's contributions is dispelled automatically as soon as one hears the new album's first single, "Call Me When You're Sober"; it's a huge, dramatic, sweeping number, complete with massive hooks and a powerful, fearless performance from Lee, that simply blows away anything EVANESCENCE has done before. Its blunt emotional assessment of a relationship battered by alcohol — by all accounts based on Lee's own two-year stint with SEETHER's Shaun Morgan — is matched by the song's perfect fusion of crunching guitars and wistful piano breaks. "The Open Door", in fact, is superior to "Fallen" in almost every respect. The production is full and lush, the group (featuring guitarists Terry Balsamo and John LeCompt, drummer Rocky Gray and since-departed bassist Will Boyd) actually sounds like a band after two years of touring, there's more real instrumentation and less reliance on loops, and thankfully none of the annoying faux-rapping that was a key component of the band's first big hit, "Bring Me To Life" (here's hoping that more rock bands feel less pressure to include some sort of hip-hop nod on their records). It's also a heavier album, clearly taking the band further into the realm of acts like LACUNA COIL and NIGHTWISH at times, although also an obviously commercial one. Lee comes fully into her own on the disc, her voice front and center throughout and never less than resonant and powerful. Where she sometimes sounded hesitant on "Fallen", there's a deeper confidence to her vocals here. Balsamo, who left COLD to take over for Moody, also steps out here as both a guitarist and writer, and his assured tones form a strong counterbalance to Lee's vocal and keyboard melodies, especially on tunes like "Weight of the World", "Cloud Nine" and the sensual "Lose Control". Not every one of their collaborations is a sure winner, and a few of the songs are propelled more by the strength of Lee's voice than the melodies or hooks. "Lacrymosa", while an interesting experiement, comes across as more of a stab at artsiness with its strings and choirs than a real song. And like "Fallen", slower tempos dominate much of the album, especially the last half, dragging the pace and making it somewhat repetitious. The beefy "All That I'm Living For" and melancholy ballad "Good Enough", however, end the disc on a stronger note. 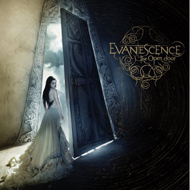 But whatever its flaws, and however much EVANESCENCE has changed in the past four years (after all, they started originally as more or less a half-assed Christian duo), this is the version of the band that should stick around. Haters will hate (especially around here) all they want, but this is a fine commercial hard rock album fronted by a female vocalist on top of her game. Will the band repeat the success its earlier incarnation had three years ago? The door is open.